I went to the Twitter party last night for a while and YES, I did see the word prompt before signing off – but it didn’t make a bit of difference because as soon as Kate Motaung announced it – you know what I said? 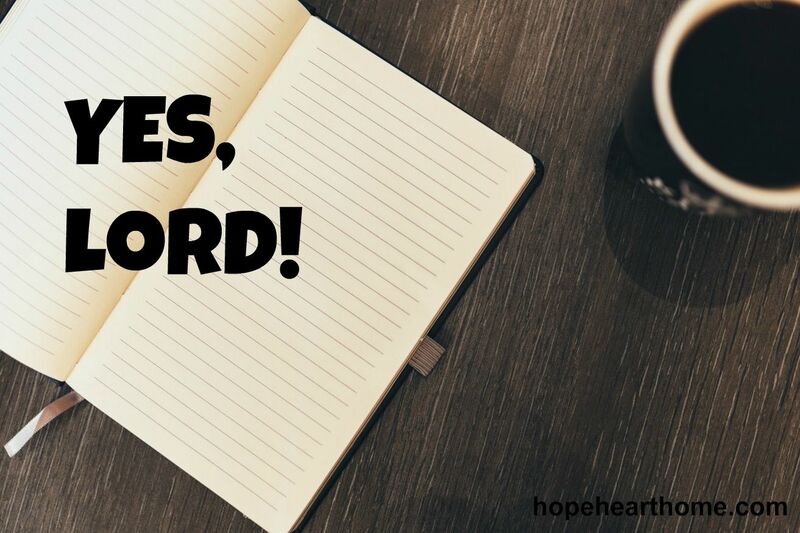 I must say this phrase at least 19 times a day, “Yes, Lord.” It has become foundational in my walk with Christ. I have a necklace that says simply, in block letters, YES LORD. I gave my two North Carolina besties, pins that say the same. Man! That sets my feet a-dancing and my heart rejoicing – just say YES, Lord. I spent years and years and years saying NO to Him – the Savior of the world – what on earth was I thinking? Stubborn. Stiff-necked. Rebellious. Run-away. Fugitive. Back-slidden and good-riddance!!! I was a wreck. God knows I needed Him, but I kept saying NO. Need to talk? Want to know more? Email me at hopehearthome@gmail.com. Find me on Facebook. I don’t think I will ever regret saying “Yes, Lord!” While in the moment I might, in the end I won’t! Me neither Jen – it just took me longer than most! Amen! I was rebellious when I was younger, too, and the Lord was amazingly patient with me. I’m still learning to get better at saying YES, LORD, but it’s something I work very hard to do! Melissa, thanks for coming by. IT IS HARD TO DO. But, definitely possible. I’m so glad you said yes to God after all those years and I’m glad I did too. For if we’d said no, then we wouldn’t have met! Amanda, love your letter to “second”…thanks for visiting! Reminds me of the camp song, “Yes, Lord; Yes, Lord; Yes, Yes, Lord.” And Ann and I toured the George Jones museum in NASHVILLE. The song made me smile this morning. I’m parked in the #15 spot this week. Love that camp song, Tara!!! Fist pump, yes Lord yes Lord YES YES YES!!! I’m learning to say “yes!”–but it isn’t always easy for this introvert ;). It gets easier, Anita….keep practicing!!!!!!!!!! A two word prayer that moves mountains, that frees us up from figuring out what’s best. Words that give Him honor. Love what you did with this word, Susan! Thanks, Linda, and thank you for coming by my interweb home today! Yes, Lord! Really enjoyed this post! Saying “yes” to God is always a good thing, always a positive thing – even if it requires something of us. I’m learning that. Marie, you ARE learning that and you will get into another elevator! Yes, Lord! Thanks for coming by. I’m glad you got to enjoy the Twitter party!! I was painting my classroom until 6pm, we ate nearly at 7pm, and this morning I thought it was Thursday until I saw Tara’s tweet and realized I had missed the entire thing. I pondered the “yes” for a while before typing but once I was moved, I wrote. So glad you said “yes” to Him. That means we’ll get to enjoy eternity together!! Absolutely. Our YES = eternal life! Love your classroom too, Tammy! I agree with Anita, a big ‘ol “Yes!” is not always easy for an introvert. But is always necessary for a Christ follower. Thanks be to God He is so ever loving patient with me when my “Yes” may be a little slow in coming. He knows I’m trying. I love hearing about people like your Pastor Esther. And I love how children can make an impact on this world by praying! Yes Lord! I’m so glad you stopped by Heart Choices and left your comment. Now that I’ve read yours I have to say …I love what you wrote. Debbie, thanks so much for coming by and loving my friend Esther!!! Awesome book too! Sandra, saying YES, LORD is the most motivating statement in the believer’s life! It’s often hard to change our stubborn ways to Yes! But the grace is there waiting for us and the rewards for saying yes are great. Thanks for your encouragement to keep on saying yes! Holly – love that GRACE He extends to us at every turn!!! Oh, YES LORD……how I need to be reminded. How I need to adopt that practice of that being on my LIPS continually. Thank you, Susan. Yes, never say amen and always say, YES, LORD. Such sweet victory when we say “yes” to God’s will for us! 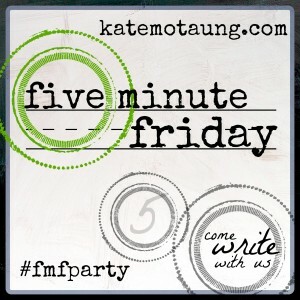 Stopping by from the FMF Party! Yes is so much easier than no!! !